Alexander Summers is the younger of the two sons of Christopher Summers, a United States Air Force Major and test pilot, and his wife Katherine Anne. When Alex was a boy growing up in Anchorage, Alaska, United States, his father took the family for a flight in their airplane. It came under attack by a Shi'ar spaceship. As the plane caught fire and was crashing, his parents fastened Alex and his older brother, Scott, into a parachute and pushed them off the plane, in hopes that they would survive. The Summers boys were put in an orphanage and Alex was soon adopted, though his brother Scott remained there for much of his childhood. Alex was raised by the Blandings, a family whose son, Todd, died in a car accident. They tried to make Alex fit into the image of their son, and he tried to as best he could. When the boy responsible for Todd's death kidnapped Alex and his foster sister, Haley, Alex manifested his powers for the first time, incinerating the boy. Sinister appeared, eager yet surprised that Alex’s potential exceeded that of Scott, but Alex seemed to lack control over his gift. Sinister placed psi-blocks on both Alex and Haley's minds, causing them to forget what had happened that night. Alex went on to study and earn a degree in geophysics at college. As a young man, Scott—now the hero Cyclops and the leader of the X-Men—located Alex, and they discovered that Alex was also a mutant. Unable to fully control his powers, Alex was captured by the villain the Living Pharaoh, who shared the same energy-absorption abilities. Locking Alex in a shielded cell, the Pharaoh was able to absorb additional energy to become the Living Monolith. After the Monolith was defeated by the X-Men and Alex was freed, the Monolith returned to normal. 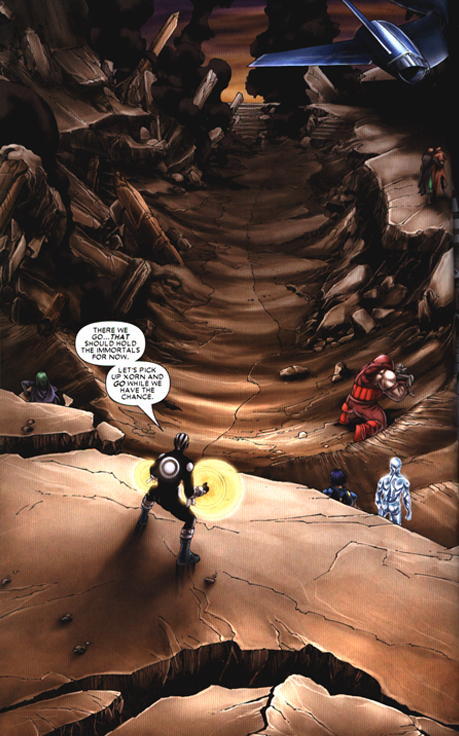 Alex was then captured by Larry Trask and his Sentinels, who were bent on controlling or eradicating all mutants. 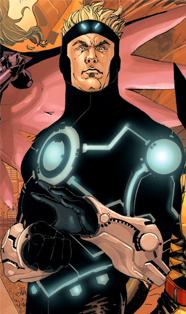 Trask fashioned a costume for Alex that would help him control his powers, and Alex took the code name Havok. Trask turned out to be a mutant himself, and the Sentinels were defeated by the X-Men. Havok actively joined the X-Men and began a relationship with Lorna Dane, Polaris, much to the anger of Iceman who was romantically interested in her. While the senior X-Men were in the Savage Land, Havok and Polaris were approached by Professor X about the imminent invasion of the alien Z’Nox. During this time the couple fell in love. Havok and Polaris were occasional members and allies of the X-Men for years. During one of their adventures, Polaris was possessed by the mutant Marauder Malice, ending the romantic relationship for a time. Havok befriended Wolverine in the late 1980s and they shared some adventures together in the Havok and Wolverine miniseries. While they were vacationing in Mexico, they were targeted by a terrorist cell. They managed to deal with their hunters but were fooled by a damsel in distress, who was actually a member of the terrorist group. Havok woke up in a hospital, in the care of nurse Scarlet McKenzie (the assassin without disguise). She manipulated Havok and made him fall in love with her. Scarlett was working for the Russian Scientist, Dr. Neutron, aka Meltdown, who wanted to use Havok as a means to absorb the entire energy of an atom reactor breaking down and transmute it into himself. Scarlett fed Alex with false information that terrorists were trying to sabotage the plant and, when he ventured into the heart of the reactor, he found it shortly before reaching critical limit. 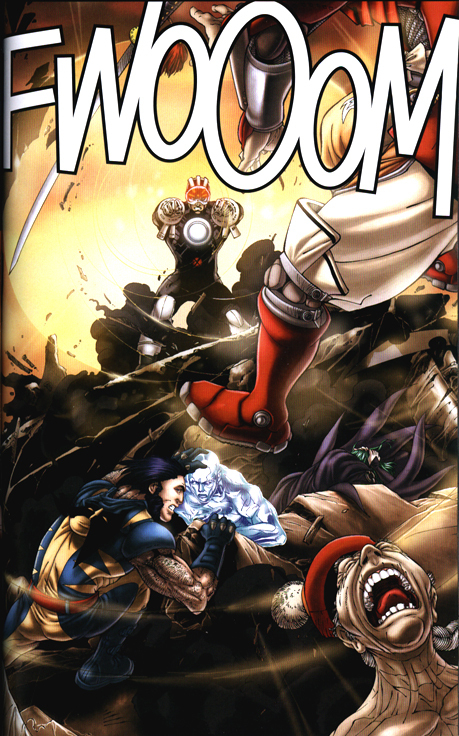 According to plan, Havok tried to absorb the dangerous radiation and, when he witnessed Meltdown killing Scarlett, he blasted him, making himself stronger. The arrival of Wolverine prevented a full disaster and after Logan killed Meltdown, Havok redirected the nuclear radiation into space. During this period, Havok became involved with Madelyne Pryor. Both of them had been rejected by their previous lovers (Her then-husband Cyclops had left her for Jean Grey). Madelyne was manipulated by goblins and became the Goblin Queen. She attempted to use Havok to help take over the world and transform it into a demonic realm. Havok eventually came to his senses, and Madelyne killed herself after discovering she was a clone of Jean Grey. Havok eventually ended up amnesic and in Genosha, a country that used mutants and genetically-engineered slaves called Mutates. He became a high-ranking Magistrate in the Genoshan army. His fellow X-Men had no idea of what had happened to him until, during the X-Tinction Agenda, the Genoshan government kidnapped members of the mutant teams X-Men, X-Factor and the New Mutants. During a pitched battle with his brother, Cyclops, Havok's memory returned but he kept it a secret, hoping to catch the Genoshan leader, Cameron Hodge, off guard. He succeeded and was the one to deliver the killing blow to Hodge. Havok and Polaris eventually reunited and he became the leader of the government-sponsored X-Factor for a time. However, Havok eventually had a nervous breakdown, thanks to the Dark Beast, and he left X-Factor to lead a short-lived Brotherhood of Mutants. He was operating independently when an airplane explosion caused by an experimental device cast Havok into a parallel world where he was the leader of a drastically altered version of the X-Men, known as The Six, and was married to Madelyne Pryor, with whom he had a son named Scotty. 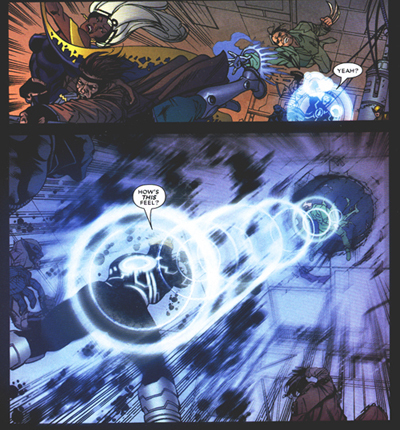 In the comic book Mutant X, a series featuring Havok as the lead character, his adventures in this other reality were chronicled, leading to a disastrous adventure which left most superhumans on that world dead, but Havok was able to save the world itself before being cast back into his home reality. Havok's body was found back in the original reality in a comatose state. The X-Men were able to restore his psyche with the help of the son of Havok's Nurse, Annie Ghazikhanian. When he was reunited with Polaris, she asked him to marry him, which he agreed to (and to the distraught of Iceman). However, unknown to Havok and Polaris, Annie's telepathic son Carter telepathically suggested to Havok to dump Polaris and forced him to love Annie, since she was lonely and Carter felt that a reciprocated love from Alex is what she need. During Lorna and Alex's wedding, Alex called of the marriage and Lorna ( a bit crazy from her recent encounter with the disasters at Genosha),tried to kill them only to be stopped by Juggernaut and Havok. Havok and Annie maintained their relationship even after Carter's involvement in the situation was revealed. When Iceman helped protect Carter and Annie, Annie expressed her thanks by kissing Iceman, who was at the time with Polaris. Havok still cared for Annie as well as Carter, a sound relationship between the two is suggest in X-men: The End, where Carter creates an illusion that he is still a child and Havok and Annie are together. However, the destruction of the X-Men Mansion at the hands of Magneto caused Annie to dump Havok and take her son away from the X-Men on the basis that it was no longer safe for the two to live at the mansion if it was going to be constantly under attacked. With Annie and Carter now gone, Havok now seems to have regained control over his mind and is now wanting to resume his relationship with Polaris, who is now dating her former boyfriend Iceman, much to Havok's shock. Havok is a mutant possessing the power to absorb ambient cosmic energy, process it, and emanate it from his body as waves of plasma in the form of a blast or discharge. These waves will emanate from his body in all directions unless he purposefully tries to channel them in a single direction, usually along the length of his arms. This results in control over an extremely powerful sort of destructive force. He is immune to the adverse effects of most forms of radiation and heat. At times he is not entirely able to control this ability, which sometimes makes him a danger to those around him unless he wears a special containment suit to assist him. Havok is immune to his own powers, and to those of his brother Scott. Despite past accounts, the energy that Havok releases is not truly a concussive force. When Havok strikes an object with the waves of intensity of hot plasma, the sudden vast jump in temperature will often cause objects to shatter, explode, or disintegrate, and an observer might therefore wrongly think that the object had been struck by a concussive force. Should Havok direct his energy at the lowest level, he can project it towards a human being and his target will suffer a severe headache but will not burn up. 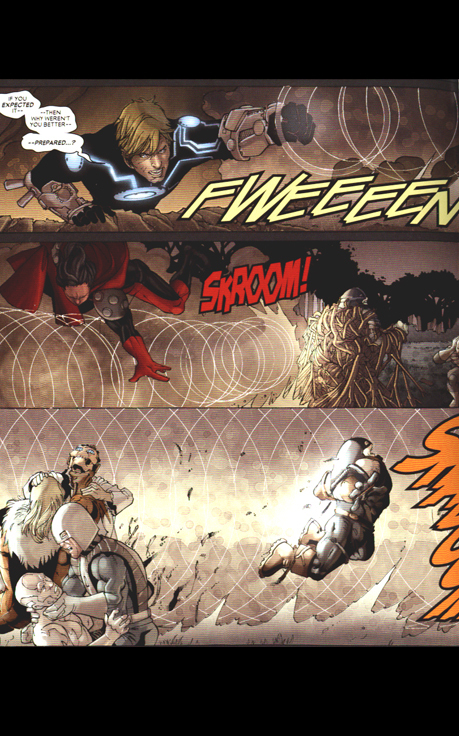 Havok's body is constantly in the process of absorbing cosmic radiation. When each of his body's power-storage cell enclaves reaches its capacity, excess energy is thereafter absorbed and immediately re-emitted in negligible quantities. Upon the total expenditure of all his available energy, it takes Havok's body about 16.5 hours to recharge to its peak level. The act of concentration involved in releasing his energy in anything other than an omnidirectional wave is physically exhausting for Havok if he continues it over an extended period of time. 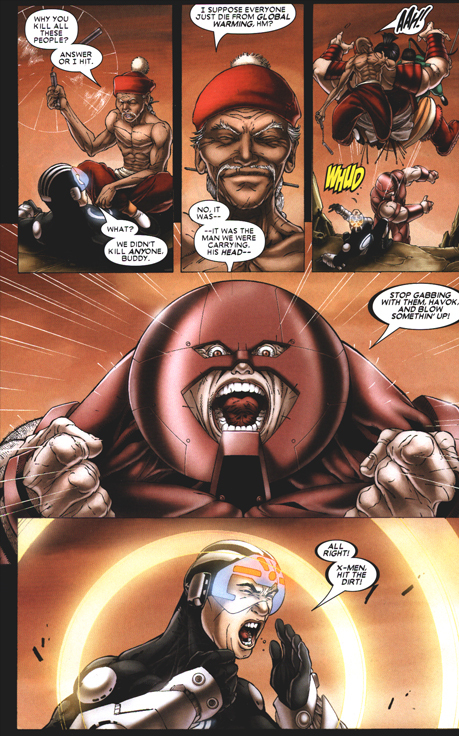 Havok possesses the normal human strength of a man his age, height and build who engages in intensive regular exercise. Havok is also well-educated in the field of geophysical science, and has been trained in martial arts by Wolverine.